Situated on a 7-acre ground, with a total capacity of 8,375 and fixed seating of 1,375, the outdoor First Security Amphitheater is Little Rock’s premier venue for live music events from the world’s major touring artists. It hosts major concerts every year, from the Riverfest to the 4th of July special, national tours, and local celebrations. 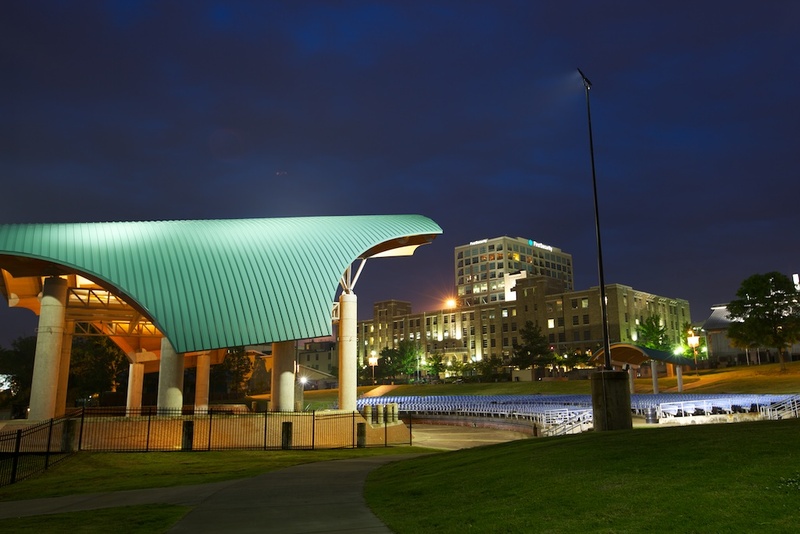 Set right on the Arkansas River, the Amphitheater provides a stunning view across one of Little Rock’s largest and most popular parks. In 2013, the venue’s canvas design was upgraded to a radius 2:16, Kynar 24 gauge standing seam roof panel, providing lasting durability for concerts to take place under all weather conditions. The First Security Amphitheater is an all-weather venue – on rainy days, guests are encouraged to bring tarpaulins to sit on and rain coats. Umbrellas are not always permitted as these can obscure the views of other guests, so be aware you may be asked to leave these at the door when entering the venue.